The more I come in this place the more I’m aware of the sense of peace and beauty one can perceive inside and around it, like an old lavatory a place where the women used to come to wash their clothes, coming along the path which connect the old factory to the above village. They carried their own … full of clothes and spontaneous herbs they could pick from the grass, herbs they used to cook. Recently, while we were on an old path along the river, we discovered a wonderful natural pool between the stones , where one can enjoy a swim fully immersed in the natural quietness or observe a cormoran bird flying on top of the river water with his magnificent wings. This building used to be a wood manufacturing factory that took its power from the water furnished by the mill. The work tradition of the valley is due to the water mill and the wood. Not too far from the museum there’s a valley named Val Foglia where up to now you can see the rest of old mills road. The Water technology allowed the population to survive in this territory for long time… Turbines substituted the mills at one point and the old mills have been abandoned. In this building you can see the turbine which took the water from the river and thanks to a system of wheels and leather strings brought electric energy to the machineries. Here in this old factory you can visit the machineries and the original tools on two levels of the buildings, you can also see how they lived in another room where old poor things remain together with their personal and particular shoes (pull), and dresses . There’ s also a smoked room where they used to dried the wood objects they produced . We also have a space for degustation of local products inside, while during the good season you can eat outside by the river. It’s also possible to relax by the river , taking a sun bath or a real bath in the water maybe after a hike through the noumerous paths leading on top of the mountains all around. It’ s possible to visit the natural carsic caves above the structure or enjoy the view of the women in their particular traditional costume, different from village to village, wearing their wool and felter shoes (pull). We have two bed rooms with 11 beds all together. One room has 6 beds and the bathroom inside, the other one has 5 bed and the toilets and showers outside. Fully immersed in the nature this place is the perfect point from where one can start for trekkings leading not only in this valley but also to the opposite Valsesia. 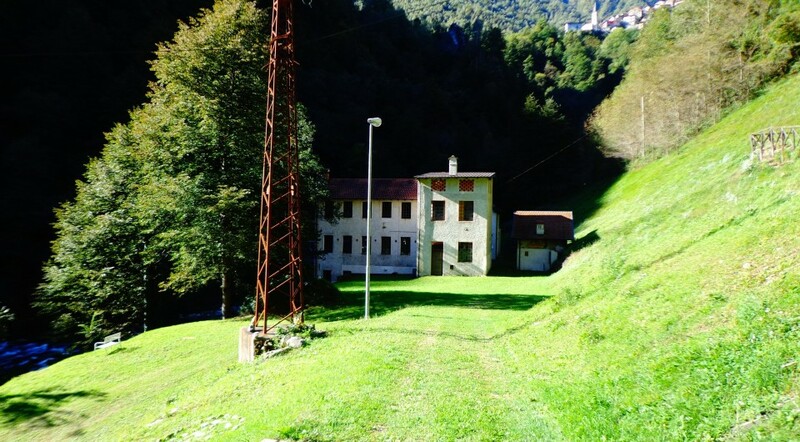 For example there ‘s the Pilgrim road that takes you to the Saint Mount of Varallo Sesia or to The Quarne. During these trekking it’s possible to rest in yhe particolar Alp houses.